With a 16 position environmentally friendly facility, the On Target indoor shooting range in Maryland is designed for convenience and comfort. Both novice and veteran gun enthusiasts have the opportunity to rent handguns from our comprehensive selection and enjoy the sport in a state of the art shooting facility. Shotguns cannot be used on the Range, and only Rifles that shoot standard handgun ammo are allowed. Ammo will be limited to 17HMR, .22LR, 9MM, 10MM, .38 Special, . 357 Mag., .40 SW, .44 Special, .44 Mag, .45 Colt and .45 ACP. At On Target, our shooting range officers patrol the facility and foster an atmosphere with safety at the forefront. 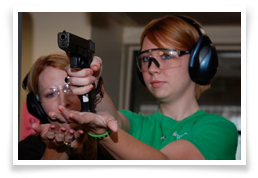 We further this foundational effort by offering an array of handgun safety courses. For the safety of yourself as well as others, we ask that everyone please review our shooting range rules section. SAFETY NOTICE: All persons desiring to enter the range must have acceptable footwear. Heels and platform shoes are not permitted as a safety consideration. The very nature of a shooting range results in cartridge casings rolling about on the floor from time to time. Every shooter is expected to maintain a proper posture and shooting stance to prevent falling with a loaded gun in their hands. This is to protect YOU and OTHER CUSTOMERS on the range. Your cooperation is required. Below, we have listed the rate card for our Maryland shooting range. If you have any questions on this information, we encourage you to contact us via phone or by completing the form on our website. Only On Target ammo may be used in rental guns. Rental guns may be exchanged for different models/calibers at no additional charge.